Getting beyond the skin surface of understanding and digging into the reality of the unreal seems beyond most of us, but it is possible to fathom deep understandings in life and reap benefits beyond our imagination. Let us look into a difficult Medresh (legendary story from the time of the Talmud) and from this we can reap rewards that were not available to us beforehand. Normally if a person gives you a loan when you are in a jam (like you lose your wallet and need money to get home) when you pay back the loan, you pay back the exact amount that you borrowed. In the Torah (Parsha V'yera, Bereshit 18:1-10) there is a story of the angels who came to visit Abraham in the guise of men. 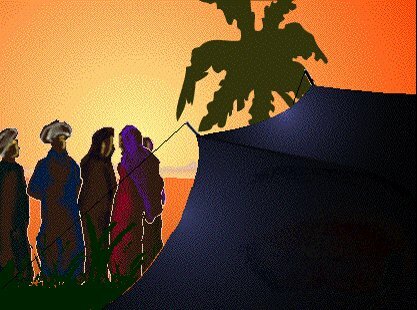 They appeared to him as travelers and Abraham thinking that they were men invited them in to his tent for a rest and a meal. The Medrash (Bereshit Rabah 45:10) tells us that for the kindness that Abraham extended to these 'men', G-d blessed Avraham's children with many blessings. For each thing that Abraham did he received a three fold blessing: one for the time they traveled in the wilderness, another for the time they inhabited the Land of Israel, and the third for the distant future. Abraham gave the men water, he gave them to rest under his tree, and he gave them bread and meat to eat; for each of these good actions G-d gave Avraham's children a three fold blessing. For example, in the merit of giving these 'men' a comfortable place to rest under the shade of the tree, the Medrash tells us that G-d promised Abraham to bless his children both in the desert in which they wandered for forty years, in the Land of Israel which became their home, and in the distant future. How? In the desert, in the merit of Abraham, they enjoyed the Clouds of Glory that protected they for forty years from the sun and the elements; in the Land of Israel they had the Mitzvah of the Sukkah, and in the not too far distant future we will merit the special protection of the sukkah. Now all of this sounds very nice and pleasant as we read it on a superficial level - but if we ask why did Avraham deserve to get such an extended payback? G-d could have just had his children sit under a tree instead of a succah. Why also does it have to be for generations to come until the distant future? Why now just pay Abraham back for only one generation? By understand this, we will be given us an insight into how G-d runs His world. Once a king had been forced to leave his palace and live incognito. He lived as a beggar going from door to door asking for a bit of food or a few coins. But the people of his kingdom did not recognize him as being the king and instead treated him poorly believing him to be a low class beggar. The king was very hungry and on the verge of starvation when he came upon a wealthy man who went out of his way and gave the king $50 to help improve his situation. Needless to say, the king was very happy and vowed to pay back the man; the man thinking that the beggar standing before him was just a very indigent and impoverished man, told him not to consider paying him back. In reality $50 for a very wealthy man was really nothing and he could afford to give it with out need to paid back. After time, the political situation changed and the king was able to return to his palace and to the kingly state in which he lived. He longed to pay back the wealthy man who by virtue of his $50 loan had saved the king's life, but it was not just the money that he wanted to pay back; he wanted to give back the man the joy that his monetary gift had given to the king. He wanted to make the wealthy man as happy as the wealthy man had made the king and of course fifty dollars would not do it. It would have to be something much more substantial. There are two methods of payment: one is the payment in exact kind (the sum of money) and the second is the payment in heart (the feelings generated by the kindness). When we are helped, we actually are obligated in both, returning the money, the external source of happiness that the kindness gave us and the internal good feelings that the kindness has generated. This is the way it was with Abraham's treatment of G-d's angels who were disguised as men. G-d wanted to reward Abraham in kind for the kindness that he extended to these 'men' who were the servants (extensions) of G-d. But by man the warmth generated is limited since we are limited beings so we have a limited obligation. G-d, on the other hand, is infinite. The joy that He felt from Abraham's kindness was a joy that knew no limitations; this joy lives by G-d for all of eternity. Therefore G-d's pay back had to be a thing that would generate joy for many generations; in the desert, in the Land of Israel and in the distant future. When a person can rise above his own physical limitation and go beyond himself to serve G-d in a manner that generates in G-d joy and internal happiness, G-d will pay him back in a manner that is beyond our understanding. It is only for us to serve G-d in truth and love as Abraham did. Abraham who did not serve G-d to receive any reward, but rather he tried to spread the truth of G-d among the heathens of his generation for the sake of G-d and not for his own sake. For this, Avraham merited his children reaping a reward that has not stopped coming and will not stop coming.